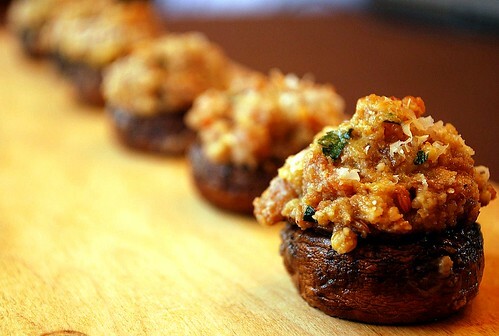 Here is the final recipe from our wine tasting – an appetizer of sausage stuffed mushrooms – the perfect bite-sized taste to accompany our fruity and delicious Barriosa Sombrero Rojo Rioja wine. 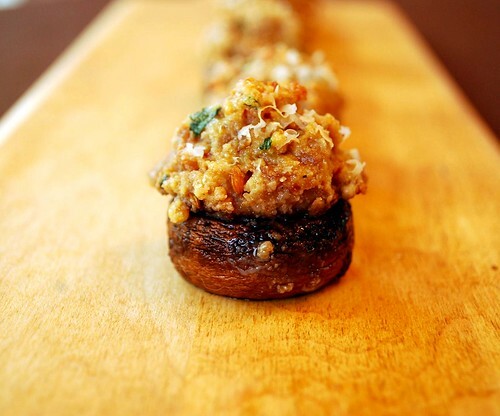 Our guests are still raving about these mushrooms over a week later – now I call that a successful dish! Preheat a heavy skillet over medium heat. Meanwhile, remove the casings from the sausages and put the meat in the skillet. Brown the sausage until cooked through, using a spatula to break apart any pieces. Remove from heat and allow to cool. Meanwhile, preheat your oven to 375 degrees and grease a large baking sheet. Arrange the mushrooms cap-side-down on the sheet and set aside. In a medium bowl, combine the bread crumbs, eggs, cheese, onion, garlic, pepper, and parsley. Add the cooled sausage to the mixture and stir until combined. Fill each mushroom cap with about a tablespoonful of the sausage mixture, and don’t worry if the filling piles up and overflows a bit. When all mushrooms are filled, sprinkle some extra grated cheese on top. Bake for 15-20 minutes, until filing is set and sizzling. Serve immediately and enjoy!